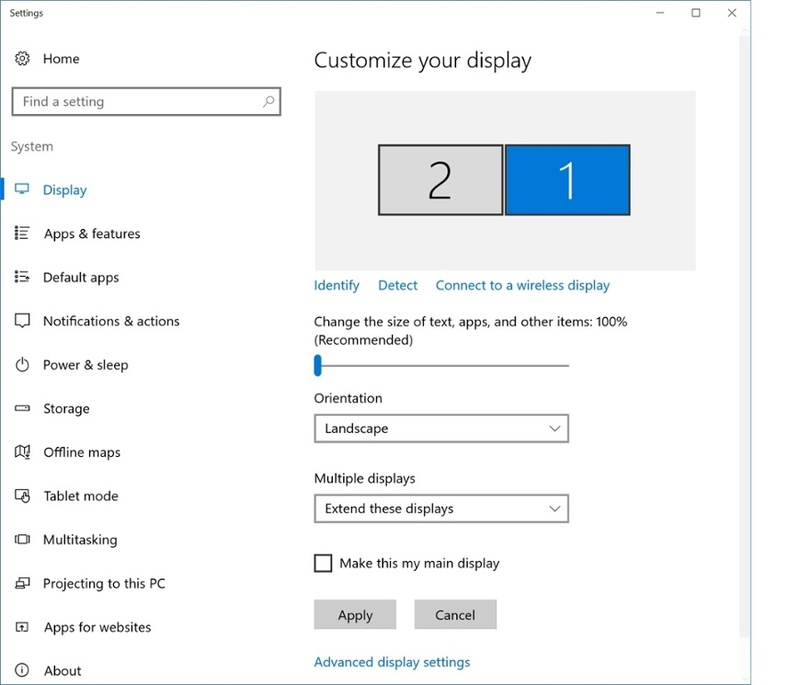 In extended display mode (frequently referred to as “Extended Mode”), the Meta 2 appears to Windows as another display alongside your other monitor(s). In this mode, the Windows desktop is extended onto the Meta 2 as if it were another monitor. Because the Meta 2 is being treated as a monitor, the display on the Meta 2 will always be active, and you may see an upside-down image of your desktop background. You can enable extended mode via the Display Manager, which can be found in the Meta Utility application under the Utilities section. If you enable extended mode in this manner, the Display Manager will automatically configure the display corresponding to the Meta 2 to be in the correct location and orientation. In contrast to extended mode, direct mode allows the Meta 2 to communicate directly with your graphics device. Direct mode is preferred as it yields improved performance. However, not all graphics devices support direct mode. When an application built with the Meta SDK’s MetaCameraRig prefab launches on a Meta 2 running in extended mode, the Compositor automatically creates a window, moves it to the Meta 2’s display, and renders in the correct orientation. Applications built with older versions of the SDK and use the LegacyCameraRig prefab do not use the Compositor, and consequently you may need to move the window to your Meta 2 manually. To manually configure extended mode, follow these instructions. Again, please note that the Display Manager provided within the Meta Utility application automatically performs most of these steps (with the exception of step 8). 1. Ensure that there is an image visible in the Meta 2 display by turning the headset upside down. You should be able to see your Windows desktop. If you don’t, see step 6 below. 2. Verify that you see the cursor by attempting to move your mouse cursor onto the Meta 2 display. If you do not see your mouse cursor on the Meta 2 display and do not see the display lighting up, please continue with the steps below. If these steps do not work, please refer to the Answer Hub. 3. Right-click the Windows desktop on any monitor and select Display Settings. 4. In the Customize your display window, click Identify to determine what ID number your Meta 2 display has been assigned. 5. Select the display that matches the number shown on the Meta 2 display by clicking on the box with the corresponding number. 6. Ensure that Multiple Displays is set to “Extend these displays,” then click Apply. 7. Set the Orientation of the Meta 2 display to Landscape. 8. Set “Change the size of text…” of the Meta 2 display to 100% (recommended). 9. Click and drag the blue box representing Meta 2 display to the far right of all other displays, making sure that the top edge of each monitor lines up. 10. Scroll down and click Advanced display settings. On the latest versions of Windows 10, this may be unnecessary, as some of these advanced settings now reside in the settings window you have already opened. 11. Set the Resolution of the Meta 2 display to 2560 x 1440. 12. Click Apply and close the Settings window.